In St. Paul, Minnesota, six enormous paintings adorn the cavernous waiting room of Union Depot. Created by Ralph Gilbert, these majestic works send viewers on a provocative journey evoking the rich history of both the region and of railways. Vibrant colors with intertwined compositions guide one through a visual odyssey as only good murals do. Each being 16’ tall, it’s hard to decipher how anyone could conceive such a body of work. Therefore, we are exhibiting the story behind the creation of the story. In most cases, the creative processes of artists remain hidden. The final product seen by the viewer, interpreted as a sudden euphoric outburst of creative genius. But in the Mary S. Byrd Gallery at Augusta University, we have the rare opportunity to show exactly how such a grandiose project developed. Mr. Gilbert is generously displaying preliminary works to include initial sketches to fully rendered paintings that led to the final masterpieces. Art is work, and it’s apparent from Mr. Gilbert’s process that inspirations is indeed, mostly perspiration. This show is not to be missed. “A Story in Pictures: Studies for the St. Paul Union Depot Murals by Ralph Gilbert” will be on display from August 17 – September 16, 2016. Mr. Gilbert will give a presentation on Thursday, September 8 at 5 p.m. A reception will follow. As we continue to build the creative community in Augusta, we’ll continue telling the story of the creative process and what it’s like to be a practicing creative person. Ralph Gilbert is an excellent story teller. I’d encourage all to attend the lecture. ArtWashing is the use of artists to inflate property values by doing what artists do best—transform spaces. It’s a common practice in urban redevelopment. Artists are economic first responders. We usually come in when rents are low and crime is high. After we settle in, things tend to improve. Then the crime drops and businesses sprout. About this time, rents inflate. The final stage occurs when local residents and artist are forced out. It’s just how it goes. ArtWashing is a quicker version where outside artists are brought in by developers or city councils to essentially flip a neighborhood. Often times, this happens without the knowledge of artists involved. In general, revitalization is good. But artists should beware of this larger game where urban populations are displaced as a result of the economic factors resulting from artistic endeavors. As we build our creative community in Augusta, we plan for inclusion and diversity by involving the community from the start: local artists, art organizations, schools and residents. We can’t involve everyone in every project. But the vision will be one of collaboration and inclusion. We seek broad-based cultural enrichment. We already have great support for this from the Greater Augusta Arts Council, Westobou and others. To help things along, the Department of Art is bringing Ed Woodham to Augusta. 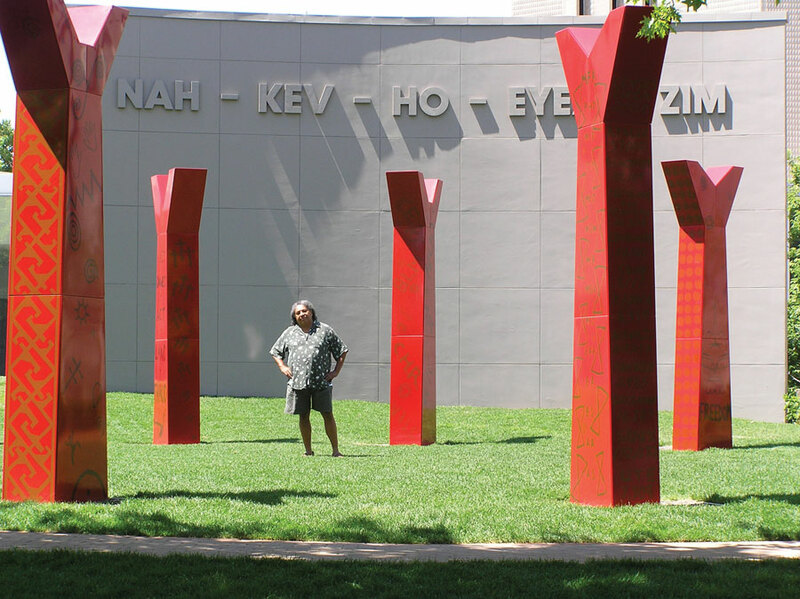 Ed’s an internationally recognized artist and educator dedicated to public art forms. He’s also the Founder and Director of Art in Odd Places. Plus, he’s an ardent supporter of local artists. Recently, even Ed was involved in a scheme to ArtWash Macon, GA. Read about his adventures in Macon. On September 6th at 5pm, Ed will speak on public art in Washington Hall at Augusta University. Click here for the event. The goal for this is to have a positive discussion to begin planning for large projects – not to badmouth other cities. We’ll update the event soon to include the room number. Artists, art organizations and members of the community are invited to come listen and ask questions. Those interested in being part of the artistic community are invited. Creative ideas are the work of collective minds. So our plan is to bring the arts and sciences together. New concepts can easily be traced to a source—which came from another source. To a degree, nothing is wholly original. Even the theories of a genius loner like Isaac Newton (and he was as reclusive and brilliant as one could be) were influenced by others. His concepts were built on the ideas of those who had come before. In a famous letter to Robert Hooke, he says, “If I have seen further it is by standing on ye shoulders of Giants.”[i] Newton knew very well that he was part of a larger network of knowledge building. It would be nearly impossible to create a way of thinking independent from the influence of others. In fact, studies have been undertaken to determine if there really are any people who are original in their thinking. I find it hard to believe than one could trace something like that. But from these studies, it appears that there are only three people who were original: “first-century Confucian metaphysicist Wang Chu’ung, 14th-century Zen spiritualist Bassui Tokusho, and 14th-century Arabic philosopher Ibn Khaldun.”[ii] Consider those three in comparison to how many people have lived on the planet—over a hundred billion. Going solo seems nearly impossible. As the Department of Art at Augusta University grows, we will foster a collective mindset through a series of interactive discussions called LASER Talks. LASER stands for Leonard Art Science Evening Rendezvous. These are events sponsored by Leonardo the International Society for Arts, Sciences, and Technology (Leonardo/ISAST). They happen all over the world including Zurich, University of San Francisco, Stanford University, UC Berkeley, UCLA, UC Davis, UC Santa Cruz, New York City, London, Tacoma, Toronto, Montreal and Kansas State University. Last year, we hosted our first LASER and became an affiliate. Thus, add Augusta to the list. Fortunately for us, the Director of Cultural Programs for the National Academy of Sciences flew in to moderate ours. He was amazing, and the event was a huge success. We packed a large auditorium with a wide range of people from the university’s upper administration to esteemed researchers to high school students. We formed our panel to include art history, studio art, otolaryngology and anaplastology. It’s amazing how quickly the audience drew connections from these seemingly disparate fields. How do we know we succeeded? No one left the room for two hours—not even to use the bathroom. That’s success. This year, plan to hold more LASER Talks. Plus, we opened it as a collaborative event including the university and region. We are collaborating with areas throughout the university to synthesize ideas from an array of fields. The first talk will be hosted by the College of Education. The second talk will be hosted by Allied Health. The third, will be the Department of Art (us). And the fourth will be a unique hybrid summit hosted by our Office of Leadership Development. Over the next couple of years, we plan to collaborate with all facets of the institution to foster conversation and collaboration between the arts and sciences. Our first LASER of the year hosted by the College of Education is on September 13. The outstanding lineup includes experts from the local area focused on STEAM initiatives and innovation in teaching and technology. I’ll announce the specifics soon. We’ll also simulcast it so everyone can view. To say Augusta is the perfect city for art may be a stretch. It’s not a cultural hub, and it doesn’t have a lot of galleries. But Augusta is the perfect city for building a transformative art department. The timing and circumstances are right. As a city, Augusta is like many others. Geographically, it’s a city between cities. There’s a river running through and a beautiful lake nearby. Suburban areas surrounding it are on an exponential growth curve. What’s unique about this place however, is how it’s changing. The obvious connections to art and the two art festivals in town which are very successful and building the level of interest in arts and culture—“Westobou” and “Arts in the Heart.” My department is involved in both. But the real forces of change are below. Fort Gordon is becoming the Cyber Command Headquarters for U.S. Army. Currently, the fort employs around 20,000 people. By 2019, Fort Gordon will be a defensive operation actively protecting networks spanning the globe. This is bringing all kinds of investment and interesting people to the area. Everyone in the area seems to be scrambling to capitalize on cyber something. Thus we are seeing an influx of tech initiatives. Rent is cheap, and tech startups don’t need a lot of infrastructure. Click here to read an article on it. Augusta University is a new institution forged from a collision of two unlike colleges. I wasn’t here when it happened, but to hear people talk, it was a collision. And with that, the Board of Regents directed it to be a top tier research institution. We have a new name and a new mission. To lead us in the right direction, we also have a new president, Brooks A. Keel, PhD. He’s an alumni of both institutions that formed Augusta University. He totally understands the future of education, and is working hard to build a leading university known for innovation. I feel very fortunate having him at the helm. To read about his vision click here for a recent article in Augusta Magazine. As of now, my department is relatively small and local. I looked the other day and we have 94 majors. We offer the regular range of degrees concentrating in ceramics, sculpture, printmaking, drawing, painting, photography and graphic design. Our faculty and staff are talented and active. As we grow, we’ll continue to offer more design oriented degrees until we reach a 50/50 relationship between fine arts and design. What makes us special though, is that we plan to develop an innovative model of contemporary art education with an emphasis on fulfilling creative careers—in a wide spectrum of fields. We’ll be building bridges between the arts and the sciences and demonstrate how universities and communities should be collaborative and complementary. In my next post I’ll let you in on one of our new initiatives. A year ago I took a position as Chair of an art department in a university existing in a constant state of flux. It’s the product of what I call an extreme merger. In 2012, Augusta State and Georgia Health Sciences Universities were combined to make Georgia Regents University. The goal was to create a comprehensive research institution. These institutions had little in common other than geography. In the short term, what happened was chaos. The name even changed once more to be Augusta University. But as the dust is settling the institution is proving to be a bastion of opportunity. As painful as the process was for everyone involved, it has created a wonderful place to work and learn. During the past year, I’ve been coming up to speed with my new institution and the community surrounding it. A surprising understanding I’ve come to is how my department is far better if we build it as a creative community. By a community, I mean a layered community extending outside the institution. The first layer resides within the department – we need to work together, communicate and support each other. The second layer includes the remainder of the institution – by working with all other departments on campus we can better utilize the wide an unexpected resources within the university. The third layer extends to the geographic area – there needs to be a fuzzy edge between the institution and the local community where collaboration is the norm. Creativity is a no-brainer because we now exist in an age of innovation where creativity is a must. Everyone institution should be ramping up support for creative initiatives. Over the next year, I’ll tell the story of our transformation from a small department (80 something art majors) serving the local community to a nationally recognized department building a creative community in Augusta. To get a full read on my vision check out this article, Scott Thorp: Designing the Future, published in the Master’s issue of Augusta Magazine. As I post, probably once per week, you’ll see how the Department of Art and the university are advancing. We just established a social media presence for the department, so follow us on twitter, Instagram and Facebook as we build our creative community @aug_artdept, #artinaugusta. At the turn of the last century, a brilliant young inventor, Philo T Farnsworth, learned the hard way some endeavors are too big to go it alone. Farnsworth had an incredible vision—one that changed the way we live. From childhood, Farnsworth was brilliant and precocious. He constantly fiddled with electronics and gizmos. As a child, he converted his mom’s sewing machine from a manual one into an electric one. Then there was one fateful day when he was fourteen. On that day, he was struck by a vision of genius while working on the family farm. The parallel rows of potato fields in front of him prompted a moment of insight for transmitting rows of electronic information that could be reassembled to form an image. At that moment, Farnsworth conceived television. [i] That moment should have also ensured Farnsworth a place in the pantheon of great scientists, but it didn’t. Instead, it signaled the beginning of a lifelong battle of frustration. There are numerous occasions like this where Farnsworth either missed an opportunity or was not qualified for what he was doing, such as arguing a case before Congress. In front of Congress, he rambled endlessly. [i] Gladwell, Malcolm.”The Televisionary.” The New Yorker, May 27, 2002: 112-116. I was privileged to be asked to juror the Greater Augusta Arts Council’s current exhibition, Icon. Augusta is fortunate to have such a wonderful organization and also to have such talented artists living in this area. The reception for Icon is Friday, December 4th. Additionally, I’ll be speaking for GAAC’s Aspirations series about the works in the exhibition. In that presentation, I’ll discuss my unique views on critique and praise. If you are in the area of Augusta, GA, please come by. The talk will be in the gallery at 600 Broad Street, Wednesday, December 9th at 5:30pm. Could a historiographer drive on his history, as a muleteer drives on his mule, straight forward; for instance, from Rome all the way to Loreto, without ever once turning his head aside either to the right hand or to the left, he might venture to foretell you to an hour when he should get to his journey’s end; but the thing is, morally speaking, impossible: For, if he is a man of the least spirit he will have 50 deviations from a straight line to make with this or that party as he goes along, which he can no ways avoid. He will have views and prospects to himself, perpetually soliciting his eye, which he can no more help standing still to look at than he can fly; he will moreover have various accounts to reconcile; anecdotes to pick up; inscriptions to make out; stories to weave in; traditions to sift; personages to call upon; all of which both the man and his mule are quite exempt from (Sterne 1967, 64-65). Among the other “ages” in which we live, we definitely live in an age of standardization. Students take standardized tests. The schools have standardized assessment. And employees are evaluated using standardized rubrics. It is like we are taking what is most interesting about humanity, diversity, and eliminating it in an effort to eliminate risk. Subsequently, we eliminate much of what is remarkable about us. We are normalizing humanity. Curious and creative people don’t fit that mold well, and I would suggest that no one really fits any mold. Strangely enough, though, even our museums have become part of this normalization process. We see more and more blockbuster shows that are attractive to a wide range of society. And subsequently, they contain fewer and fewer items of controversy. Museums have created larger, more informative placards and even offer headphones for guided tours to ensure that we don’t misinterpret the creative expressions of artists. Walking through museums these days one will see people as engrossed in the information provided for a work of art than the work itself. It does seem obvious that a disciplined use of an exhibit would beget greater learning. And it is easy to argue that exhibitions are most effective “if a visitor decides to carefully attend to any of the exhibits, using them in a comprehensive manner.”[iii] Moving deliberately through each component of an exhibit should create a more edifying experience. And it was uncovered that those approaching exhibits with a focused strategy did obtain a greater level of mastery than those who were moderately focused or unfocused. Curiosity driven museum-goers are anticipating new experiences—to have their curiosity piqued. They aren’t looking to ascertain every bit of information displayed. This, however, directly contrasts what curators plan for them—to learn subjects in depth. Furthermore, curiosity driven visitors develop strategies for “piquing and satisfying” their curious nature. Just having a goal of “piquing and satisfying” in itself is quite irregular. Goals usually are a means to an end. Piquing and satisfying is more of a means to more. This is also problematic for curators in that using an exhibit to pique and satisfy might have little to do with the curator’s intended purpose of the exhibit itself other than it being an agent for something else—a catalyst. Curious: I wonder if the artist were standing or sitting while painting that. Information Seeker: Why do you ask? Picture By Jim Wileman 24/01/2012 Generic images from Exeter’s Royal Albert Memorial Museum. Knowing that not all exhibits are equal, a curious museum-goer is motivated to stay away from the lackluster exhibits or risk boredom. Briefly consulting guides or maps helps to familiarize one with the territory. Then the rule is to get moving and start scanning. Walking through the exhibits, one should take note of individual items within exhibitions, not the overall exhibit. General things aren’t interesting, specific things are. And the final rule for scanning is to follow the crowd; wherever people are gathered, there is a good chance that something interesting is nearby. However, there is a risk that these people aren’t curious and they are looking at a dull exhibit, so the curious museum-goer should be willing to leave any exhibit that doesn’t live up to expectations. The final set of rules for the curiosity driven museum-goer are related to quitting. Knowing when to leave an exhibition is just as important as knowing which ones to focus on. As stated earlier, if an exhibit isn’t interesting from the beginning, don’t stay around—move on. Also, when moving from individual exhibits within a large exhibition, it’s the three strikes and you’re out rule. Don’t stay to see if the next one is a good one. Museums are normally large and exhausting, especially if one were to see all the exhibits, so don’t. Once you feel full, it is quitting time. Don’t feel obligated to keep looking at more. Acting as a curiosity driven museum goer is strangely rewarding. Additionally, piquing and satisfying curiosity is unexpectedly educational. However, there is an odd sense of guilt that looms when you skip large portions of exhibitions. It’s as if you aren’t paying the proper respect to the institution of high-culture. Large museums in major metropolitan areas are the best for experimenting with this approach. The Metropolitan Museum of Art in New York is my favorite. Book stores with a large magazine sections work for this approach too. On your next visit to the bookstore, scan the magazine racks with the same strategies as the curiosity driven museum-goer. Look at what strikes your interest and put it down once satisficed. Then move on to the next interesting magazine cover. [i] Rounds, Jay. “Strategies for the Curiosity-Driven Visitor.” Curator 47, #4 2004: 389-412, http://0-vnweb.hwwilsonweb.com.library.scad.edu/hww/results/results_single_ftPES.jhtml. 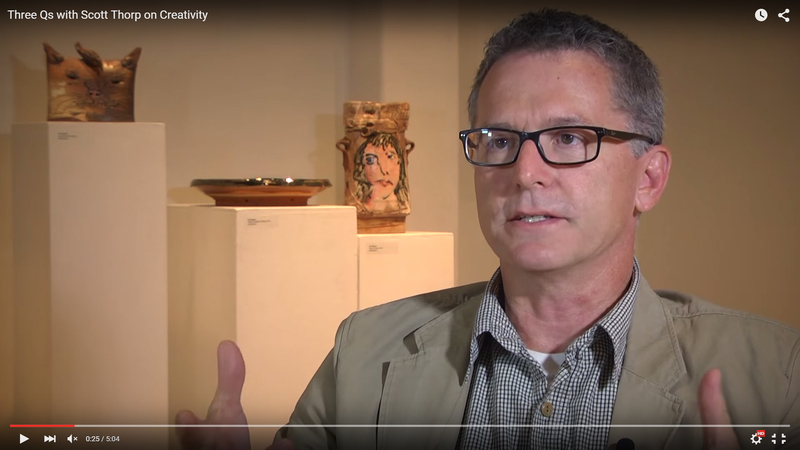 Scott Thorp, chair of the Department of Art at Georgia Regents University (soon to be named Augusta University), explains what creativity is and whether it can be taught. Click here for video. My latest publication with ArtPulse Magazine is now up. You can find it on their Facebook site. The title is “Don’t Believe Miss Liberty: A Talk with Edgar Heap of Birds.” Click on that link it you’ll see it. Edgar is a fascinating artist questioning many of the cultural roles we play. The intro is below. Edgar Heap of Birds with Wheel, 2005, sculptural installation at Denver Art Museum. Courtesy of the artist. Of the many atrocities against Native Americans, the thousand mile death march known as the Trail of Tears is probably the most recited. But throughout U.S. history Native Americans have suffered numerous injustices, many of which have left our collective memory. Even the Great Emancipator, President Lincoln, isn’t clean. His order to execute Dakota Indians in Minnesota resulted in the largest mass hanging in our country’s history. Edgar Heap of Birds is a provocative artist bringing attention to the sad irony which is the plight of Indigenous Americans. Cheyenne by blood, his work utilizes contemporary conceptual and postmodern tactics to expose some of the less civil accounts of American history, ones that get little attention in today’s press. From large scale celebratory sculptures like “Wheel” to road-sign-looking text based installations, his work addresses the issues of land ownership, displacement and cultural imperialism still haunting those of Native American descent. Recently, I spoke with Edgar about his life, his art and his views of contemporary culture. During our conversation, what struck me most was the level of compassion and generosity coming from an artist making such aggressive, politically charged work. As you will see, he embodies the core value by which Cheyenne chiefs are defined, generosity.